You’ll learn a tonne from ‘The Bulletproof Diet’ by Dave Asprey. He is well known as a biohacker from Silicon Valley and for his brand ‘Bulletproof’.Dave has spent 15 years and $500,000 of his own money biohacking his body and working with medical staff to figure out the best diet and biohacks for optimal physical and mental performance. This book will show you the benefits of bulletproof coffee, biohacks, the benefits of intermittent fasting, how to get into ketosis, the best supplements, and much more! This book tells about why starving yourself can be beneficial, why athletes and entrepreneurs are putting butter in their coffee, how to enter ketosis for optimal performance and why multivitamins are trash. LESSON 1: What is The Bulletproof Diet? Asprey aims to fulfill this. It’s made up of healthy fats, organic vegetables and protein foods. Healthy fats account for 50% to 70% percent of the diet and can be found in foods like grass-feed, read meat, cocoa butter, coconut oil and various bulletproof products. Dietary fat contains more energy per gram than any other nutrient so it is most effective at delivering energy to the parts of the body that need it. It also has the least impact on insulin levels. Insulin is the hormone that regulates blood sugar levels. Organic vegetables make up 20% of the diet and include things like asparagus, avocado, broccoli, Brussels sprouts and more vegetables that are rich in vitamins, minerals and fatty acids. Protein is another 20% of the diet and includes grass-feed, beef and lamb. Pastured eggs, gelatin and colostrum proteins are the building blocks of the body. They are used to make muscles, enzymes, hormones, neurotransmitters and more. Chronic inflammation can be dramatically reduced by avoiding anti-nutrients including lectins, phytates, oxalates and mold toxins. Inflammation is the body’s natural response to a toxin stress or trauma. It’s only when inflammation lasts for months or years that it causes major problems. Cardiovascular diseases, various cancers and diabetes account for almost 70% of all deaths in the US and the common link between all of these diseases is inflammation. The bulletproof diet is designed to eliminate as many anti-nutrients as possible. The idea of starving yourself temporarily is scary however there are plenty of scientific benefits including cancer prevention aid with fat loss, building muscle and increased resilience. It’s also been shown to increase focus in preventing chronic diseases and increases neural plasticity. This makes it easier for your brain to grow and evolve. The problem with intermittent fasting is that you can feel an energy drop in the middle of the day. It’s also difficult to resist the urge to eat. Asprey came up with a new technique he calls bulletproof intermittent fasting. This is a hack that allows you to reap the benefits of intermittent fasting without the negative side effects. 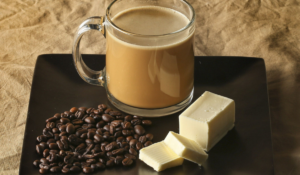 This is where bulletproof coffee comes into play. It consists of two cups of hot brewed coffee made with low tops and coffee beans, up to two tablespoons of grass-feed, unsalted butter and up to two tablespoons of coconut oil. It can make you feel full for six hours so you can resist the temptation to eat and reap the benefits of fasting. Many athletes and entrepreneurs are drinking it such as professional wrestler Samuel Shaw and entrepreneurial legend Pat Flynn. It keeps you alert, energized and rejuvenated throughout the day and it also helps you enter ketosis faster. Ketosis is a beneficial state where your body burns fat for energy instead of sugar. Usually your body burns carbohydrates for fuel but when it runs out of carbs it starts converting fat to glycerol for energy. 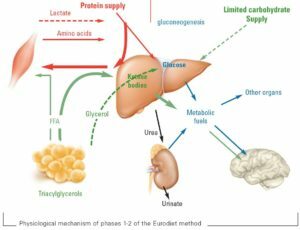 Your liver produces ketones as a by-product of this fat metabolism which puts you into ketosis. Its controversial but your brain and body work more efficiently on ketones rather than glucose. 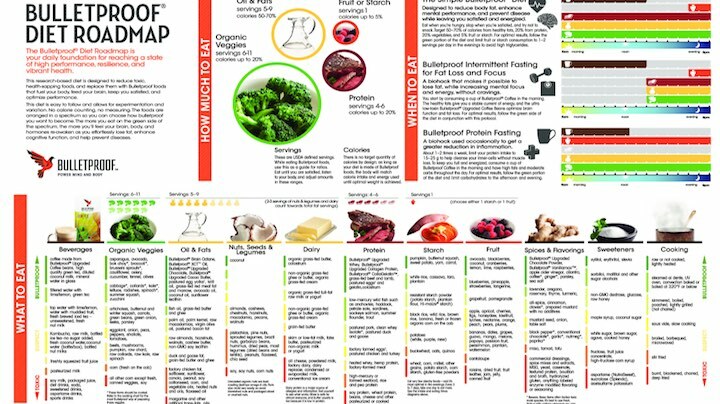 The bulletproof diet aims to keep your body in a state of ketosis so you’re constantly in a high state of performance. 1.To save on production costs they are often stuffed with cheap fillers which can make it difficult for the body to absorb. 2. The dosages of each individual substance is imbalanced leading to over or under consumption. How much of each substance you need depends on your own body’s needs. Asprey highly recommends you take high quality targeted supplements based on your own needs. It’s best to get a blood test from your doctor so you know what you’re deficient in. The following have an amazing cost benefit ratio and Asprey believes they are the ten most important supplements that most people should be taking for optimal performance. Vitamin D is probably the most important bio hack from the world of anti-aging and human performance. It affects one thousand different genes and plays a helpful role for hormones like testosterone, growth hormone and estrogen. It moderates immune function and inflammation and assists in calcium metabolism and bone formation. If you’re not getting much exposure to sunlight then Asprey recommends you take one thousand international units for every 25 pounds of body weight. Alternatively you can go out in the sun wearing a tank top and shorts for 10 minutes and your body will produce around ten thousand international units of Vitamin D.
Magnesium is almost as important as Vitamin D and is used in over 300 enzymatic processes to provide yourselves with energy. Magnesium deficiency is associated with cardiovascular disease, diabetes, asthma, anxiety, PMS headaches, muscle cramps and nausea. Dave recommends 600 to 800 milligrams per day. Although supplements sound great, don’t rely on them for the life-changing effects. Always buy targeted high quality supplements, get a blood test and you will realize that your overall diet, sleep and exercise will give you way more health benefits than supplements. More on Bulletproof Diet in coming out in the next Post.Keep reading and share. The content is grasped from here.